Having a wide temperature range (-40 to +180°C) and being very lubricious we tend to find AP101 most commonly used in bearing applications. As operating conditions can vary from the simple to the sublime, it is critical that the technical team are made aware of all available technical data to ensure our greases can be specified confidently. In order to keep track of the many technical queries we receive, they are all entered into a database system. This can prove to be an interesting tool when searching for previous applications e.g. AP101s application history includes vacuum metalizing rotary carousels, gas distribution network ball valves, laser welding titanium devices and vacuum injection into high grade Japanese motorcycle chains! AP101 owes its lubricious nature to two important component materials – polytetrafluoroethylene (PTFE) and lithium stearate. Both these materials exhibit excellent thin coating capabilities, and when applied to the surfaces of two moving parts that are in physical contact, the barrier the grease creates reduces wear and extends service life. 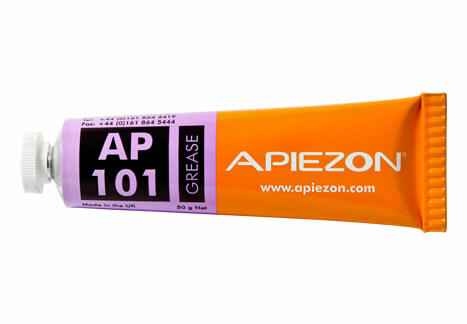 We also receive a notable quantity of grease users looking to confirm that AP101 does not contain any silicone, which is understandable as silicone grease has a tendency to migrate from its intended location – a phenomenon referred to as “creeping”. This can result in process contamination and a depletion of grease quantity which is why none of our Apiezon products contain silicone. As our products have been available for many decades the Apiezon brand name is well-recognised and well-respected in the industry. This heritage has led to many instances of our products being written into specifications. A prestigious example of this is when Marconi Radar stated in their specification that only Apiezon lubricant was to be used on the Mannesmann Dematic clean room crane system.